Evolution is a beautiful thing, resulting in sublime forms such as the platypus, Brangelina, and now the La Sportiva Spantik. Still innovative after four years on the market, the Spantik represents all that is good in the alpine world. The Spantik achieves the holy grail of boot design: it's a double boot that feels like a single boot. It even manages to feel lighter than its 5lb 1oz scale weight, combining and improving on the best of composite shell technology from the Nuptse and the mid- and outer-sole of the Nepal EVO GTX. What this means to you is not having to sacrifice warmth for technical prowess or vice versa. Does it work? Not just yes but hell yes. On vertical ice at temperatures well below freezing it feels nimble and precise, yet even with just a liner sock on I never felt even a tinge of cold. The fit is just a little roomy in the toe box (I have slightly narrow feet) for a perfect fit once I added a thick mountaineering sock. The lacing system is what you first notice on the Spantik. It's a single very thin lace on each boot that closes either with a velcro tab (inner boot) or by wrapping around a disc (outer boot). Here's the beta: modify the pull on the outer boot lace so it doesn't slip over the keeper knot and carry a spare set in case of breakage and you will absolutely love it. It sets the cuff to the desired stiffness around your ankle for great support and does not slip: hallelujah! If you can afford the price of entry, rest assured that the Spantik is not just some marketing exec's overhyped glands at work; it delivers true innovation. Let me just say I think Gollum would have been a cooler name for La Sportiva's new approach shoe, especially since he climbs like 5.18 or something. So he kills midgets and other small game, even a mutant has gotta eat, right? Anyway, it's weird, they didn't ask me so we've got the Gandalf... oops! Copyright alert: new name: Ganda. Also, now available in a high-top Guide version. I've had mixed luck with the approach shoe category. They are either too much like a rock shoe or not enough. That's changed with the Ganda: it fits like a glove, laces to the toes and with a combination of slip and board lasting it smears and edges well enough to work your way up 5.10 or beyond, depending on ability of course. It also hikes comfortably. The dot pattern tread is not so deep that it collects too much mud, but is just featured enough to provide decent scrambling. Bring a brush to clean 'em up at the base of the climb and you're all set. The Ganda can definitely replace a hiking shoe/rock shoe combo for easy to mid difficulty multi-pitch and big wall climbs with big walk offs. All approach shoes have to trade off durability of the sole for friction purposes, but the Ganda is designed to be resoled. 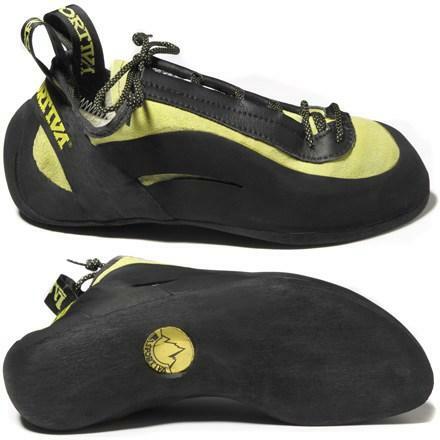 With Sportiva's Italian-made quality this shoe deserves consideration, even if the price tag would make Gollum blink. Guides and other climbers who work as much as they play in the vertical world will rejoice. What do I have in common with Tommy Caldwell and other top climbers? Unfortunately only my La Sportiva Miura rock shoes, because I get kicked off their walk-up routes faster than the French can surrender. Years after the Miura was introduced it still shows up on the hardest lines. These little lace-up slot cars are designed to concentrate power on to your big toe for the ultimate in small-foothold performance. Pain-free? Hell no! But if you can get grit your teeth long enough to become accustomed to the feeling of standing on the last knuckle of your big piggie while it squeals like... well, a pig, you will climb like a scared cat. How's that for mixing animal metaphors? La Sportiva continues to have the best footwear lacing systems in the business, and the speed laces on the Miuras cinch tight with no effort and stay that way. The Vibram XS soles grip like a gecko, although I have managed to rough mine up pretty good in just a season. The Vibram is supposed to be pretty tough so maybe it's my sloppy climbing style. I'm man enough to admit it. 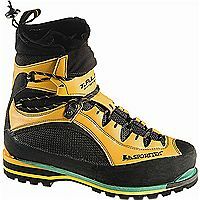 These are great all-around high performance shoes that excel at all types of climbing. Try them on a little small; I'm normally a 42 but I went with a 41 on the Miuras. You'll notice a little extra material that bunches on top of the toes, but it doesn't seem to affect performance and the fit is otherwise very precise. La Sportiva hand crafts the highest quality footwear in Northern Italy, and even finds time to throw a bone to the weekend warriors out there who don't need the entire force of the universe transmitted through their big toe (we're talking about you, Miura!). The La Sportiva Arco is a beginner's shoe, but the flat fit built on a forgiving last provides all day comfort for anyone who isn't climbing teen grades. The left-right dual velcro closure is quick and easy, even with gimpy hands after a long pitch. The Arco is comfortable enough you might not take it off as often as you do the foot Ferrari you're using on your two-year project. Top quality at a reasonable price, and you get the same rubber that Tommy Caldwell wears, a full 5mm of Vibram XS. And skanky feet, fear not: the Arco uses a synthetic Dry Best anti-funk liner in the arch and tongue, with unlined leather everywhere else. 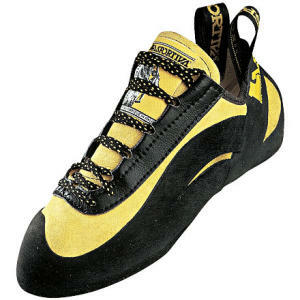 Like almost all La Sportiva footwear, best for medium to low volume feet. Like the big-game guides say, if you're going after a big 'un make sure you bring enough gun. When the big 'un is high-altitude, high-latitude and cold enough to evaporate your pee before it hits the snow, La Sportiva's Nuptse double boot is your BFG: big freakin' gun. The six-pound Nuptse is NOT a plastic boot: it's built from a combination of insulated, coated polyurethane and other materials, and the materials and articulated design result in an exceptionally warm, comfortable and flexible that feels somewhere between plastic and leather when hiking and climbing. Bonus: the gusseted tongue opens wide to easily get your dogs in. What's not to like? Aside from being a bit on the porky side it's a wide boot. 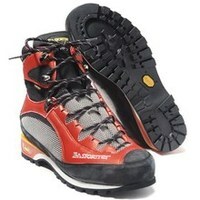 Specifically the toe is wide enough that it is difficult to get the front toe bail on step-in crampons to fit snugly. We tried Black Diamond Sabretooths, Grivels and Stubais and none of them attached well in the front. With that caveat, get combi crampons and you're good to go. Single-boot heaven is what we've got here. La Sportiva only does boots, and their more-than-a-mouthful Trango S EVO GTX has been around a while and is still top of the line. 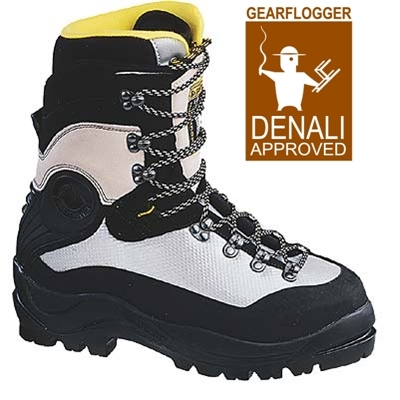 I won't even try to list all the funky-named technologies they stuffed into these boots: they are lightweight, waterproof and take a combi crampon is what's what. I reamed these suckers out on Rainier, bouncing them off rocks, ice and my partners head when he wouldn't shut up. Using the trusty ol' double-sock method - a thin liner sock under a medium-weight hiking sock - the only problem I had was a little heel lift that was easily solved by cranking down on the laces. The Trangos took a lot of abuse and didn't flinch, with no malfunctions or even much visible wear. They give plenty of ankle support for a fifty-pound pack, and they climb like hyperactive goats. Comfy and warm, I've had no problem wearing these down to around zero degrees. A great choice for climbs and conditions that don't require a double-boot or a lot of vertical ice, and at a mere 3.2 pounds they won't slow you down. 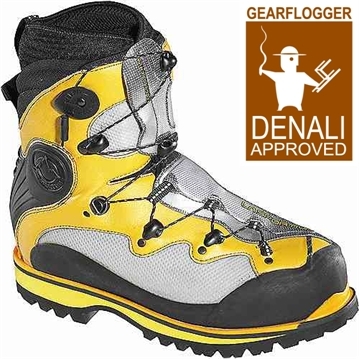 Anyone who has a gear closet knows that boots are like bunnies: we're talking rampant overbreeding with a pair for every sport-specific application I can possibly rationalize to the SheFlogger, no easy task. I was willing to make the effort for a lighter, faster, more precise boot to fill the void in my life that is mixed climbing. Luckily, if it lives on your feet La Sportiva has a solution: cue the Trango Ice EVO, a sleek racecar of a boot that transitions seamlessly between dry tooling and vertical ice. Sportiva only does feet, and that focus shows in the way they innovate with features such as the lacing system on the Spantik and the "Tri-Point Lacing Harness" on the Ice EVO. It performs as advertised, locking down the heel no matter how much you torque your foot around. It is a little tricky to tighten since you have to pull forward on the laces to tie them, but the intermediate locking lugs help. To round things out there's an integrated Schoeller gaiter up top, a grippy Vibram sole on the bottom and Thinsulate insulation in between. I climbed in temperatures around the single digits Fahrenheit and they felt great. 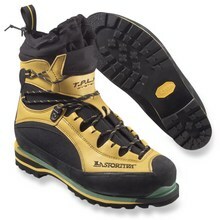 In action the EVO is more climbing shoe than mountaineering boot. Paired with the Grivel Rambo 4 crampon the entire mixed experience starts to feel more precise, with enhanced control over your movements and less effort overall. If you've been climbing vertical ice and/or mixed with a truck of a mountaineering boot, do yourself a favor and try the Trango.